GLOUCESTER CITY COUNCIL VOTES UNANIMOUSLY FOR ORDINANCE CHANGES REGARDING PIPING PLOVERS AND ALL WILDLIFE!!! Thank you Community for seeing the wisdom in these changes and for giving voice to these tiny endangered birds. Last night’s Council vote a was win for our Good Harbor Beach Piping Plovers and a win for all the citizens of Gloucester. There was a tremendous turnout by the Piping Plover volunteers and friends, as well as an impressive number of letters written to the Councilors in favor of the changes to the ordinance. The combination of the two spoke volumes and definitely tipped the scales in favor of the Plovers. Our sincerest thanks to City Councilors Scott Memhard, Paul Lundberg, and Melissa Cox for putting forth the ordinance. 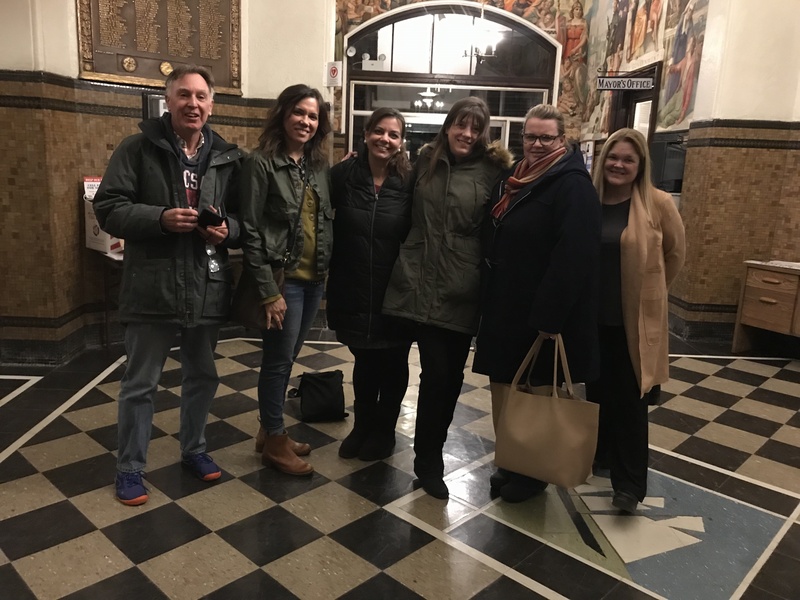 Our sincerest thanks to O and A Councilors Steven LeBlanc, Jamie O’Hara, and Sean Nolan for voting unanimously to put the ordinance change to City Council for a vote. A huge shout out to all the Councilors for voting YES! Thank you to Jim Destino for presenting on behalf of Mayor Sefatia and the Administration. And a huge shout out to Alicia Pensarosa and the Animal Advisory Committee for their tremendous presentation and a job well done. Next steps are tighter enforcement, and signage, and with the ordinance in place and increased awareness, I am very hopeful this can be accomplished. Thank you Councilors for providing me the opportunity to speak. The Mass Wildlife Piping Plover 2017 Census Report, with Dog Ordinances, which was submitted last week, affirms why prohibiting dogs on affected beaches by April 1st is the correct course of action needed to protect our Piping Plover nesting areas. The April 1st date has been determined best course of action by the Massachusetts Department of Conservation and Recreation (DCR), Trustees of Reservations Coastal Shorebird Protection Program, Mass Audubon, USFWS National Refuges such as Parker River (where dogs are prohibited year round), and our own Gloucester Animal Advisory Committee. Only one chick out of eleven has fledged during the last three years. Rather than focusing on who is to blame, and who reported what, and how many times incidences were reported, I hope we can come together and do what is best for this tiny endangered bird. Beach communities that take full precautionary measures to protect the Piping Plovers have a greater than 80 percent success rate in fledging chicks. Communities that only take partial measures have a 20 percent rate of success in fledgling chicks. Gloucester’s Animal Advisory Committee, under the leadership of Alicia Pensarosa, has recommended a full set of precautionary and protective measures, which are in alignment with neighboring communities, and they include creating a buffer zone, better signage, increasing fines, precautionary roping in place by April 1st, stricter enforcement and, the single most important piece of the protective measures, to prohibit dogs on the beach from the dates of April 1st to September 30th. The Endangered Species Act (ESA), which also applies to threatened species, specifically prohibits the “taking” of Piping Plovers. Taking doesn’t only mean killing, taking also includes, harassing, harming, and removing. The ESA requires Federal agencies to take action to prevent further harm and harassment. By only taking half-hearted measures, and without strict enforcement, our community is at high risk of beach closures and heavy fines. Piping Plovers are facing tremendous pressure from human disturbances, natural predators, loss of habitat, and rising sea level. One of the single most pervasive threats to Piping Plovers is dogs disturbing the nesting area, and we have seen this first hand over the past three years, beginning in May 2016 when the Piping Plovers first began nesting at Good Harbor Beach, continuing through 2017 and 2018. The result of dogs disturbing the nesting area last spring forced a Piping Plover pair to nest in the Good Harbor Beach parking lot, a highly unusual and dangerous outcome, and this is well documented. Here is why dogs are a threat not only to Piping Plovers, but to all nesting shorebirds. To a Plover, dogs look and act like coyotes and foxes. Whether the dog is on a leash or not, to a shorebird’s brain, a dog is scary. Dogs unwittingly crush eggs in the nest, accidentally crush chicks, chase adults, and eat chicks. But that is only part of the story. Because all leashed and unleashed dogs appear threatening, even if your pooch is the sweetest most non-threatening creature that ever lived, dogs cause the adult Plovers to go into protective behavior. By protective behavior, I mean that the Piping Plover will try to distract the dog with a series of vocal calls (which also disturbs and brings its mate to the scene), by running in front of the dog, and by pretending it is weakened by dragging its wing on the ground (imitating a bird with a broken wing). 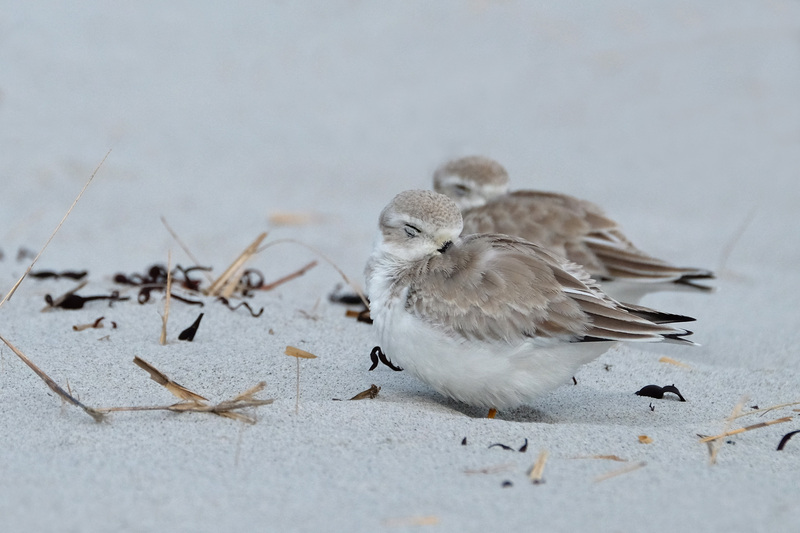 These protective behaviors are very stressful and force the Plover away from the nest and chicks, often far down the beach, leaving the eggs and babies open to attacks by gulls, crows, and raptors. During the night, a Piping Plover may encounter a disturbance by a single coyote or fox, or two, but when dogs are permitted on the beach during nesting season, the dog traffic and disturbance can be unrelenting, quite literally, with hundreds of dog disturbances per day. 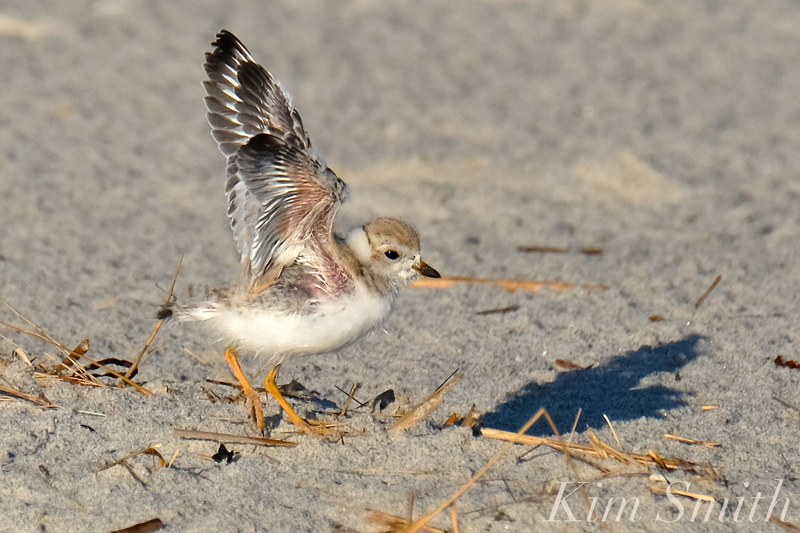 Piping Plovers have a much greater tolerance for humans. For example, they do not try to chase people out of their territory and will often behave very nonchalantly, unless, of course, a chick is nearby. But just as they perceive dogs to be threatening, Piping Plovers also perceive kites, drones, and balls as threats for similar reasons, because these airborne activities appear to be flying predators. 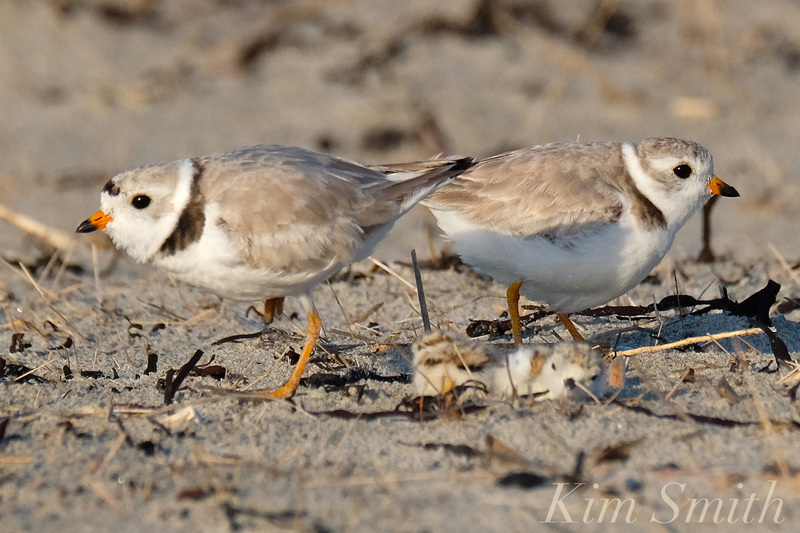 Last year, Piping Plovers were first seen at Good Harbor Beach on April 3rd The small flock appeared very weary, but after a few days of resting, pairs began actively courting. Countless dog disturbances, especially during the very early hours of the day, and late in the afternoon, caused the Boardwalk #3 pair to abandon their nest on the beach and to nest in the parking lot. These disturbances and nesting dates are well documented. Constant dog disturbances also caused a second pair attempting to nest at the Boardwalk #1 area to abandon its nest scrapes, and Good Harbor Beach altogether. Since 2016, I have also been documenting Piping Plovers at Coffins Beach and Cranes Beach. Last year, I began following Piping Plovers nesting at both Revere Beach and Winthrop Shores Reservation because these two beaches are more similar to Good Harbor Beach. 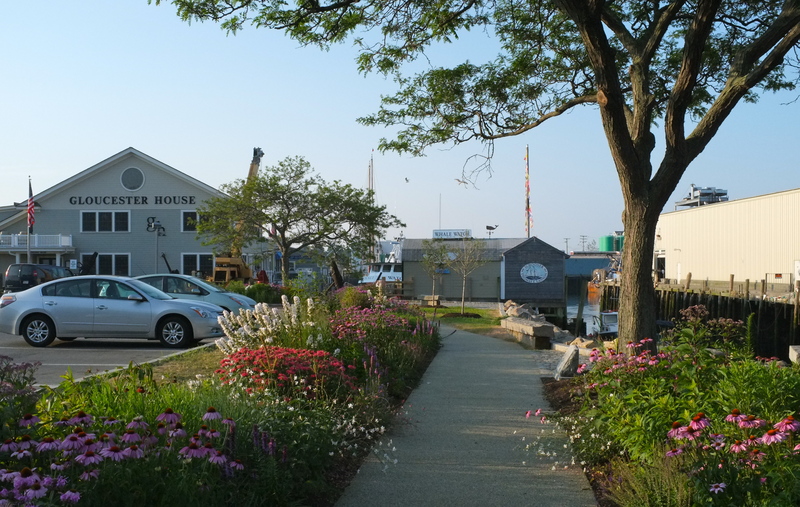 Revere and Winthrop, like Good Harbor, are highly trafficked beaches frequented by locals and by people from out of town, and we can learn a great deal from these communities. Both Revere and Winthrop Shores Reservation follow the guidelines of the Massachusetts Department of Conservation and Recreation where precautionary fencing is installed by April 1st, and no dogs are allowed. If chicks can fledge from Revere and Winthrop beaches, so too can chicks fledge from Good Harbor Beach. The problem is much greater than a small number. The faces have been blocked because I don’t want law enforcement to go after specific individuals. The photos are meant to show the much larger issue, that there are many, many dogs disrupting the nesting area on Good Harbor Beach during the month of April. All photos were taken on April 28th and 29th at Good Harbor Beach. April 28th was a warm off leash day. The nesting area at No. 3 was being impossibly overrun with dogs in the roped off section. Because of the uncontrolled dogs running through the nesting area, it would have taken at least three monitors to monitor only No. 3, not to mention area No. 1. Photos No. 2-14 were taken within a one-hour time period. Photos 2-5 show a woman on her cell phone ignoring her dog, her dog runs into the nesting area and goes pooh, she goes into the nesting area to clean up while in the mean time, her dog continues to run through the nesting area with a pal. Photos 6 through 12 show a bunch of different dogs playing in the nesting area and could be photographed with roping as part of the photo. Photos 13 and 14 show dogs up by the nest, at the dune line. Photo 15 show the dog tracks in the nesting area. The PiPl had given up on the beach and moved to the parking lot because there was far less dog disturbance there. Photos 16-18 show their parking lot nest scrape, mating behavior, and trying to camouflage on the white lines of the parking lot. They stayed in the parking lot the entire day and did not eat or drink. I returned to Good Harbor beach the following morning, an on leash day, hoping that it would be quieter and the PiPl could catch a break, but instead found a number of dogs off leash. I hope these photos are helpful in showing why it is so critically important to prohibit dogs on the beach during the month of April. And that it is clearly not a “small number of dog walkers” causing the disruption to nesting. Thank you so much again for your time and consideration. This entry was posted in Birds of New England, Cape Ann Wildlife, Gloucester, Gloucester Plover, Good Harbor Beach, Piping Plover, shorebirds and tagged #sharetheshore, Beautiful Birds of Cape Ann, beautiful Birds of Massachusetts, Charadrius melodus, dog disrupting Piping Plovers, dog ordiance massachusetts beaches, dog ordinance change, Gloucester City Council, Gloucester Masachusetts, Good Harbor Beach, Piping Plover, Plovers on February 27, 2019 by Kim Smith. Tomorrow, Sunday, at noon, is the dedication of the Gus Foote Park. 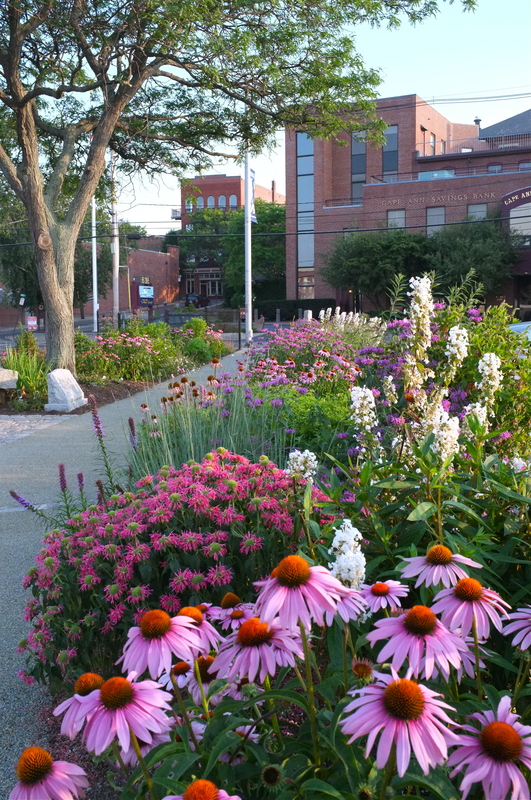 Following the dedication, I will be giving a mini-talk about the butterfly gardens along the walk. A yummy clam chowder tasting is planned, provided by the Gloucester House Restaurant. At 12:45, we’ll Walk the Walk with Mayor Kirk. The theme of Sunday’s walk is Gloucester’s maritime heritage. Sunny skies are predicted for tomorrow–perfect weather for strolling through the gardens while listening to sea stories. I hope you’ll come join us! 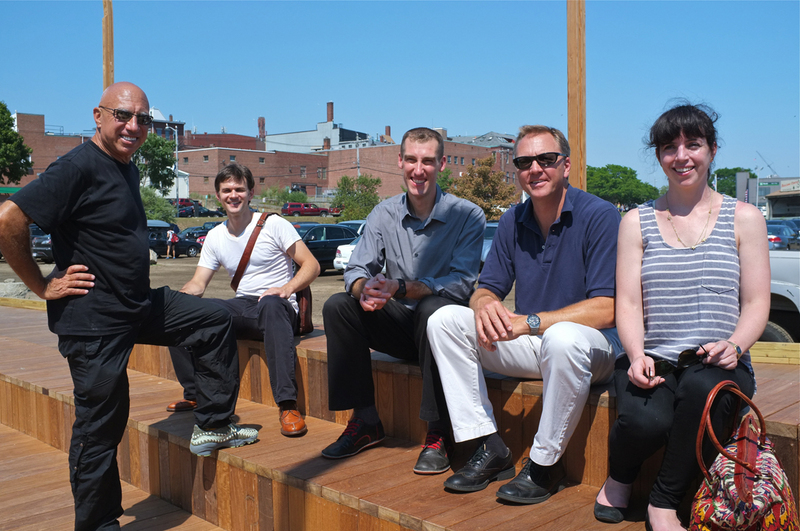 From left to right Peter Sollogub, Principal; Ethan Lacy, Chris Muskopf, Tim Mansfield, and Rosie Weinberg. Gus Foote, now 82 years young, is a retired Gloucester City Councilman. 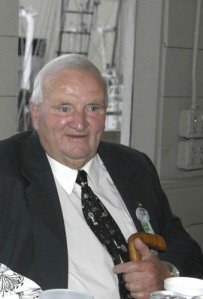 He represented Ward 2 for more than three decades. In 2011, Gus was reappointed by Governor Deval Patrick to serve another five-year term on the Gloucester Housing Authority . This entry was posted in Creating a Butterfly Garden, Events and Appearances, Fujifilm x100, Gloucester, Home and Garden, Lepidoptera ~ Butterflies, Skippers, and Moths, Life at the Edge of the Sea, Native Plants, Photography, Wildflowers and tagged and Rosie Weinberg, Chris Muskopf, Gloucester City Council, Gus Foote, Gus Foote park, Peter Sollogub, Principal; Ethan Lacy, Tim Mansfield, Ward 2 on August 11, 2012 by Kim Smith.